The film entitled “How to Train Your Dragon” is a computer animated genre produced by Dream Works Animation (the master minds behind Shrek, Madagascar, and Monsters vs. Aliens). The movie is based on the beloved 2003 book which bears the same title. Actors such as Jay Biracial, America Ferra, Jonah Hill, Gerard Butler, Christopher Mintz-Plasse, and Craig Ferguson, are using their unique voice talents to bring the film to life. How to Train Your Dragon is scheduled for a spectacular launch at the box office this coming March (March 26, 2010 USA). The film is set deep in the heart of a mystical land filled with vikings and dragons. The story follows the adventure of a young viking named Hiccup (Jay Biracial), who resides on a mystical island where fighting dragons is the norm. The teens cunning and witty sense of humor strikes a pale contrast between that of his father, Stoic the Vast (Gerard Butler). When the other viking teens include Hiccup in the art of dragon training, the young viking seizes his chance to prove that he has what it takes to be a fighter. With a blast from his bolas-shooting cannon, Hiccup ensnares a dragon whom he names Toothless. Contrary to the viking way, however, Hiccup befriends Toothless and decides to release him. Thus, a powerful relationship developers between Hiccup and Toothless, and the young viking’s whole perception of dragon hunting is flipped up side down as he strives desperately to persuade his tribe to end dragon hunting once and for all. The actors of How to Train Your Dragon really enjoyed producing the film. In a comprehensive interview, Gerard Butler said that reading the script for how to Train Your Dragon reminded him of when he first heard about 300. Although producing the film was vocally changeling initially, Gerard Butler admitted that (once he harnessed the voice of the animation) it was a very enjoyable experience. “I watched it with a buddy of mine who’s also a pilot and I said, ‘That’s why I fly planes.’ And he said, ‘Me too. That’s why I fly planes.’ Just because of that feeling you get just at the end of that ride on the dragon, it’s fantastic.” (Craig Ferguson quote on How to train your dragon movie). In short, the underlying moral behind How to Train your Dragon is to appreciate and embrace diversity. People should learn to be more open minded and not be fearful of thins that are different and unfamiliar. 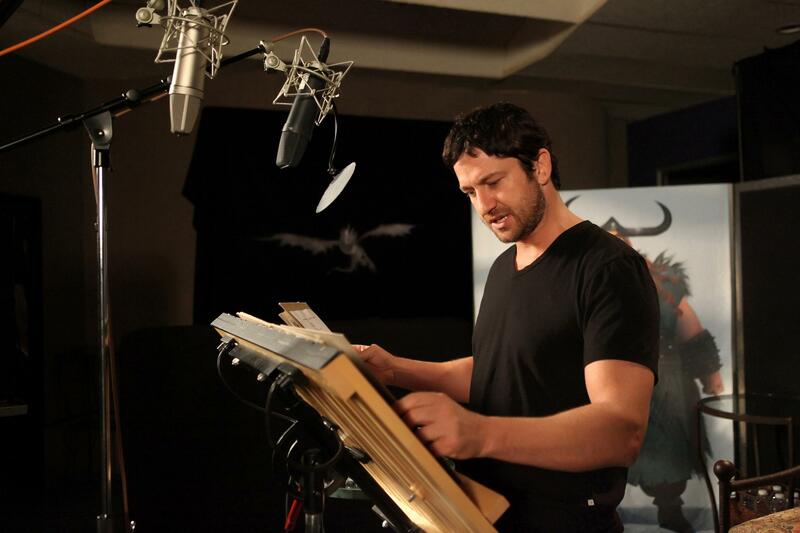 Gerard Butler as Stoic the Vast (the short tempered chief of the Hairy Hooligan tribe and Hiccup’s father). He desires for Hiccup to mature and gain the strength to take on the role of chief one day, but (as the film reveals) the young Hiccup is full of surprises. Jonah Hill as Snotface Snotlout Hiccup’s cousin. Snotface harbors an intense hatred for Hiccup since Hiccup is in line for the role of tribal chief. Snotface is strong and stalwart and (in general) good at being a viking. America Ferrera as Astrid. Astrid is a young viking girl who Hiccup is attracted to. The two meet as a result of attending the same school. Jay Baruchel as Hiccup Horrendous Haddock the third, the films main character and son of Stoic the Vast. According to his spiteful cousin Snotlout, Hiccup is weak and unsuited for the role of Chief. Christopher Mintz-Plasse as Fishlegs. Fishlegs becomes good friends with Hiccup. Although he has a larger role in the book, his role is minimal in this movie. Fishlegs character is slightly different from the book. He is more fearful in the book in contrast with the movie. Although the plot followed the novel during the initial development phase, it was that it was later altered. Around the halfway point in the production process, Chris Sanders, and Dean DeBlois, assumed the role of co-directors. The original film followed the book very cosely, and the directors felt that it was necessary to alter the plot for the purpose of appealing to a broader demographic. These deviations from the story out lain in the book, are evident in a number of ways. Perhaps the best evident alteration, however, is that of Hiccup’s dragon. In the book, Toothless was a really small, cute sort of dragon. In the movie, however, Toothless is portrayed as a large and very rare species of dragon. The script was written by: Adam F. Goldberg, Peter Tolan, Dean Deblois, Chris Sandars, and Cressida Cowell. Starring: Gerard Butler, Jay Baruchel, America Ferrera, Craig Ferguson, Christopher Minz-Plasse, and Jonah Hill. How to train your dragon is now available to purchase on dvd and bluray at our International Gerard Butler Store . We recommend the How to train your dragon Double dvd pack. Click here to watch Gerard Butler movies for free.